Sometimes choosing a dryer doesn’t mean picking the first brand name you come across at your local retailer. Often the better choice is made by doing some research and choosing a high quality product that may not sport the same name recognition. If that’s something you’d consider when you make your next dryer purchase, then you can begin learning about the Miele company and their impressive line of dryers below. 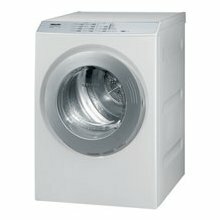 Miele dryers have a number of different unique features that set them apart from the rest of the ones on the market. One example is the Honeycomb Care technology touted by the company. Basically, the inner part of the dryer’s drum contains outward-pointing hexagons but this is not just a cosmetic difference. These hexagons create air pockets which provide cushions to prevent wear and tear on your clothing. Plus, there will be less creasing on the dried clothing. Miele dryers also provide other features as well. Specially designed sensors are placed in the dryer to monitor all aspects of the process, including moisture levels and temperatures. As the sensors identify changes, it adjusts the drying process to meet those changes. Plus, the dryers host a wide range of timed drying programs – more than you’ll find with other dryers. If you want your dried clothes ready to be ironed, a setting is available for that. Another unique design feature is the condenser dryer. Most dryers use an external vent which helps keep the moisture out of the dryer and the system. However, these vents need access to the outside environment but that’s just not always feasible. Instead, these dryers created by Miele are designed to keep moisture from escaping from the system and allows the water to be drained away instead. The benefit of using this type of dryer is they can be placed anywhere. Also, because they produce less moisture than any other condenser dryers on the market, they are not going to produce mold in the home. Of course, one of the most unique and innovative additions to the Miele line of dryers is known as the PC update. What happens is that a technician can use a laptop to adjust the programming of the dryers. That means you can adjust how much electricity is used by the dryer and the settings of the dryers. The Miele dryers come in three different capacities: super large, large, and standard. Almost every model in the company’s catalog is full of these state-of-the-art features listed above which is very rare for any company. Most leave off the best features in the low-end models. In fact, even the standard capacity dryers have other convenient additions, such as on/off switches for the buzzers and multiple drying programs. Some of the Miele dryers also have turbo drying options so you can get your laundry finished quickly. They also have lights to indicate the entire process so you’ll always know at a glance how much longer it will be before your clothes are dry. Plus, you’ve never seen controls on a dryer like those on a Miele unit. They let you easily adjust multiple aspects of the process, including setting options for temperatures, choosing drying programs, and more. It’s an impressive dashboard that is also easy to use. Plus, you can purchase an optional stand for your dryer. The stand keeps the unit off the floor but also provides additional storage thanks to a handy drawer. The drawer would be a perfect space for fabric softener sheets or other laundry supplies. The only possible drawback of purchasing Miele dryers is the price. Even the lowest end models cost more than $1,000. Some cost well over $2,000. Another drawback is that finding a showroom in the United States can be a challenge because showrooms are only available in ten states. On the other hand, if you’re interested in proven quality and durability plus the option to have a vented or non-vented dryer, the effort and the price may be worth it.